File consists of papers regarding plants or flowers presented during the regular monthly meetings of the Chelmsford Women's Institute. 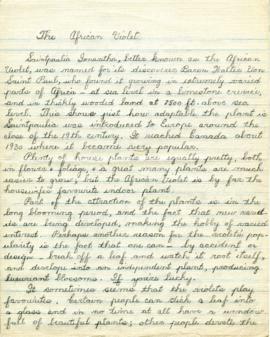 Item is a four page paper, handwritten in pencil on lined linen paper, regarding the African Violet. This paper describes where the flower grows naturally and how to grow and care for the flower as a house plant.